Summary : Not your ordinary boring and light white tea, this tea from the Dragonwater Tea Company (now out of business) perfectly blends the subtle flavor of white tea with a delicious strawberry flavor. Review : Perhaps because it is snowing outside, I found myself in the mood for a white tea. Of course, I'm usually in the mood for white teas anyways since they generally taste so good. Yet, due to their high price I tend to not buy that many. Yet, after searching through my tea samplers, I discovered an overlooked tea from the Dragonwater Tea Company (now out of business) called, simply enough, White Strawberry tea. Did someone say strawberries? Talk about a perfect blend on a cold, snowy evening. Nothing like a nice summer fruit to take away the chill of a winter evening. And so it was with those happy thought in my head that I ripped open the package to give this tea a try. Here is how Dragonwater describes this tea on their website : "White Strawberry Tea. High grade Chinese white tea with a delicious strawberry flavor." As you can see, a pretty simple description. And the ingredients are pretty simple too...white tea with strawberry flavor. I like simplicity, so I had no reservations about this tea. My first encounter with this tea was with its beautiful aroma. Talk about a wonderful aroma...especially on a cold evening. The tea had a delightful strawberry aroma too it, yet one that wasn't overpoweringly strong. Which, for a white tea, if of course a good thing...the last thing you want with a white tea is an overpowering aroma to it. Better yet, the flavor of this tea basically matched it's aroma. The tea is truly a perfect blend of quality, subtle white tea...with just a hint of sweetness...along with the strawberry flavor that is infused into the tea. The flavor of strawberry in this tea is quite distinct, yet it is not nearly as strong as say a strawberry herbal tea. Instead, the strawberry flavor just simply blends in perfectly with the taste of white tea. Overall, if you have found white teas "boring," I would suggest giving this tea from the Dragonwater Tea Company (now out of business) a try. You'll get the best of both worlds with this tea...the subtle, semi-sweet taste of a quality white tea with just the right amount of strawberry flavor. Recommendation : Yes. This is a superb white tea. 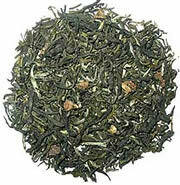 High quality white tea leaves blend perfectly with the strawberry flavor that has been added. This tea also makes for a perfect white tea for people who have never tried a white tea before, too. Brewing Instructions : Use 1heaping teaspoon of leaves. Pour water heated to 180 degrees over leaves. Let brew for 2 minutes. Due to the high leaf quality, you should get 2-3 infusions from each serving of leaves.